Despite the painful short-term effect of rising prices for consumers, in the medium-term the economy should benefit from the IMF-programme related reforms. Currently President Sisi is firmly in control of political power, as the military government has a tight grip on the country. Although there is dissatisfaction among the population with his authoritarian rule and painful economic reforms, large-scale public uprisings are likely to be contained. The internal security situation remains tense with an elevated risk of terrorist attacks. In the Sinai Peninsula and the border region to Libya, Jihadist forces are stirring unrest. The largest of those groups is the so-called “Sinai Province”, an affiliate of the Islamic State. There have been several attacks targeted at the Christian minority. Egypt is heavily relying on financial support from Gulf-states, especially Saudi Arabia. Egypt has joined Saudi Arabia, the UAE and Bahrain in the economic and diplomatic boycott of Qatar and the alliance against Iran, which could create further goodwill, but also risks dragging Egypt into a long-lasting regional conflict. 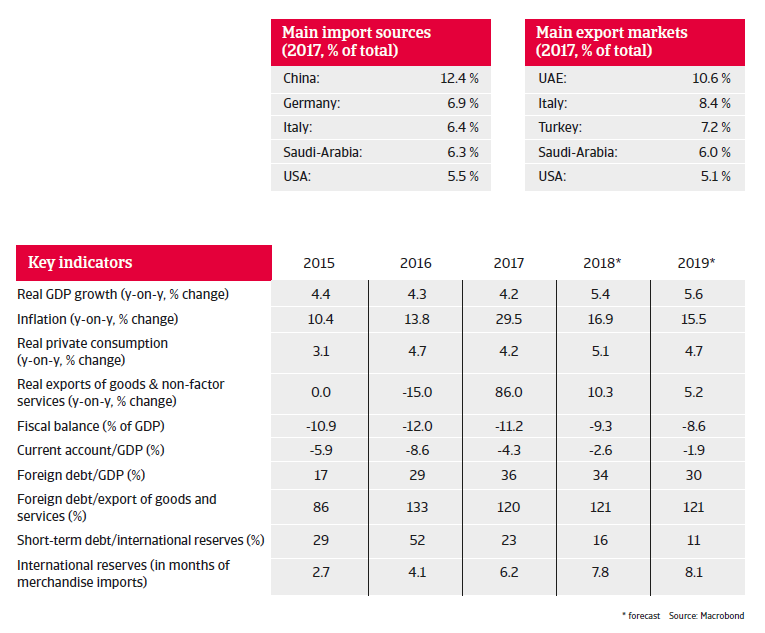 Egypt´s economic problems mounted in 2016, with a very high budget deficit of about 12%, low levels of foreign exchange, shortages of USD and a large financing requirement. In November 2016 the government finally accepted an IMF programme with a three-year facility of USD 12 billion in order to obtain much-needed external financial support. The main objectives of the programme are a flexible exchange rate, fiscal consolidation and introduction of structural reforms. In addition to the IMF, other multilateral institutions (e.g. the World Bank) and countries (e.g. Saudi Arabia and the United Arab Emirates) provide additional financial support. As a precondition to obtain IMF support Egypt had to float the fixed exchange rate, raise taxes and reduce subsidies on electricity, fuel and food. The Egyptian pound depreciated sharply (about 50%) after the float in November 2016. In order to support the currency and to curb inflation, the central bank sharply increased the benchmark interest rate (currently at 16.75%). A progress review in May 2018 was positive and allowed the disbursement of a third tranche of USD 2 billion from the loan, bringing the total amount released so far to USD 6 billion. 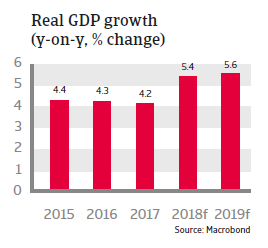 In 2018 and 2019, annual GDP growth is expected to exceed 5%. 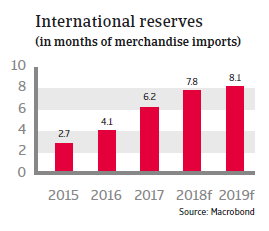 While the currency depreciation has improved external competitiveness, it has also triggered high inflation as prices for imports have increased sharply. Subsidy cuts have added additional pressure on consumer prices. 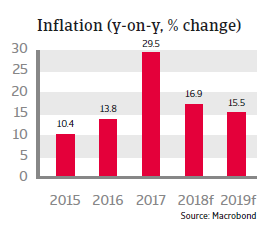 Despite decreasing since 2017, inflation is expected to remain above 15% in 2018 and 2019, impeding stronger consumer demand. 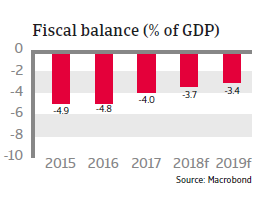 Although the budget deficit is still high, guided by the IMF programme, it is gradually decreasing. The government has introduced a VAT and cut subsidies to reduce the deficit, but some subsidies (e.g. on food) have been increased again to alleviate the impact of high inflation on household purchasing power (a large part of public spending is still geared towards maintaining social stability). Public debt peaked at 111% of GDP in 2016, but is expected to decrease to 94% of GDP in 2018 and 89% of GDP in 2019. With a floating currency, Egypt is able to absorb external shocks better. Due to rising yields private capital inflows have increased, with Egyptian Treasury Bills being particularly popular with foreign investors. Improved USD liquidity has paved the way for the easing of capital restrictions since June 2017. In the banking sector USD liquidity and the capital adequacy ratio have improved while non-performing loan ratios have decreased. However, various downside risks remain: in the past local commercial banks were the main financiers of the budget deficit and the sovereign exposure is still high, amounting to about two thirds of total credit. Egypt´s external position has improved, as due to the large external financial assistance international reserves have increased. The import cover of almost eight months in 2018 is more than sufficient to cover external financing requirements. 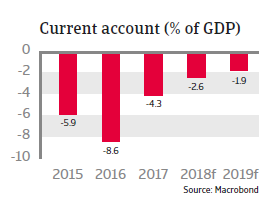 The current account deficits should further decrease in 2018 and 2019. Foreign debt increased in 2017, but remains at acceptable levels (34% of GDP in 2018). Despite the painful short-term effect of rising prices for consumers, in the medium-term the economy should benefit from the IMF-programme related measures. Most important has been the easing of the chronic USD currency reserves shortage. 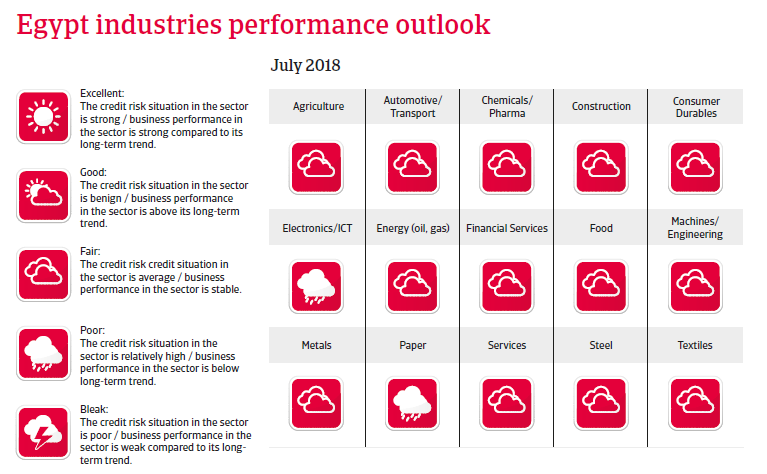 Additionally, both exports and the tourism sector are benefitting from currency depreciation and the related improvement in cost competitiveness (although tourism remains vulnerable to terrorist attacks). Investor sentiment has improved and private capital inflows have increased after the relaxation of capital controls. The more benign economic outlook is also sustained by the discovery of large offshore gas fields. Increasing domestic gas production should improve electricity supply and support economic activity in coming years.